Gossip Girl Photo Gallery: "The Unblairable Lightness of Being"
We posted two promos earlier today. Now here are photos from next Monday's episode of Gossip Girl, "The Unblairable Lightness of Being." 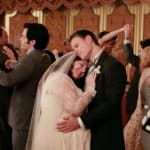 Chuck helps throw a wedding for Dorota, who insists that she and Vanya have a traditional wedding before her parents arrive from Poland. She doesn't want them to find her knocked up with no husband, after all. Will Dorota's nuptials, as shown in the images below, help the broken up Chair reunite?